Producers in New York have shown interest in injecting manure into grass fields and alfalfa fields but have concerns about the potential for mechanical damage when injecting manure. In 2014 and 2015, six field trials were conducted to answer two questions: (1) will application of manure increase alfalfa and grass yields?, and (2) does injection reduce yields due to mechanical damage of the root system? In 2014, trials were conducted using a 4th year, low producing, tall fescue site and a thin 4th year alfalfa stand at the Musgrave Research Farm, in Aurora, NY. These two trials were continued in 2015. In 2015, we also added two trials using two higher-producing 2nd year alfalfa fields at the Cornell University Ruminant Center (CURC), in Harford, NY. Treatments included: (1) “disk down no manure” (slicing the soil, no manure) (2) injection of liquid dairy manure (slicing the soil, with manure); (3) no manure addition (no slicing, no manure); and (4) surface application of manure (no slicing, with manure). In the alfalfa trial at Aurora, manure was applied after 1st cutting in both years (4000 gallons/acre in 2014 and 8000 gallons in 2015). In the tall fescue trial, manure was applied after 1st and 3rd cutting in 2014 (4000 gallons/acre) and in 2015 (8000 gallons/acre for each application). The 1st manure application to the CURC sites (4000 gallons/acre) took place in the fall of 2014, after 4th cutting. At CURC, a second manure application (8000 gallons/acre) took place after 1st cutting in the spring of 2015. Manure was injected using a Veenhuis shallow disk injector in 2014 and a modified, larger scale, unit in 2015 (Figure 1). Figure 1. A shallow disk injector designed for small scale research used in 2014 (A) and a shallow disk injector designed for large scale operation used in 2015 (B). Does hay benefit from manure? 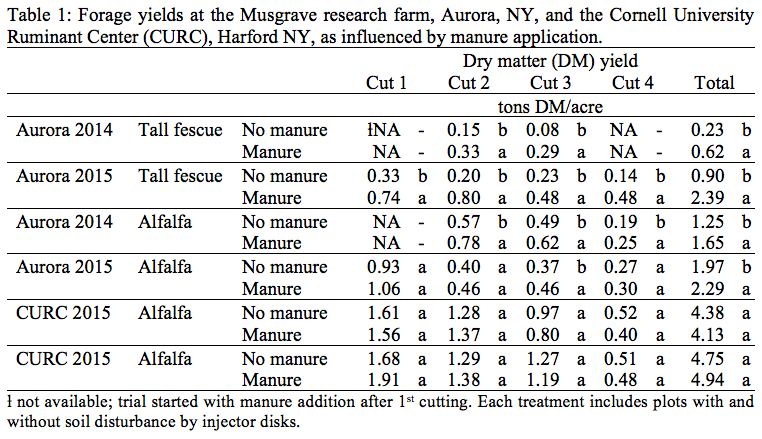 In Aurora, manure application to the older alfalfa stand resulted in a 0.40 (2-4th cutting, 2014) and 0.32 ton/acre (1-4th cutting, 2015) increase in yield, for both injected and surface-applied manure. The tall fescue stand at Aurora also responded with 0.39 (2nd+3rd cutting, 2014) and 1.49 ton/acre (1-4th cutting, 2015) higher yield with manure application (Table 1). In contrast to the findings for these old stands at Aurora, the 2nd year alfalfa at the CURC site did not respond to manure addition (Table 1). Alfalfa yields in 2015 were more than 2-fold higher at the Harford site compared to Aurora, most likely reflecting the age of the stand and manure history of the fields. Does injecting manure decrease hay yield? 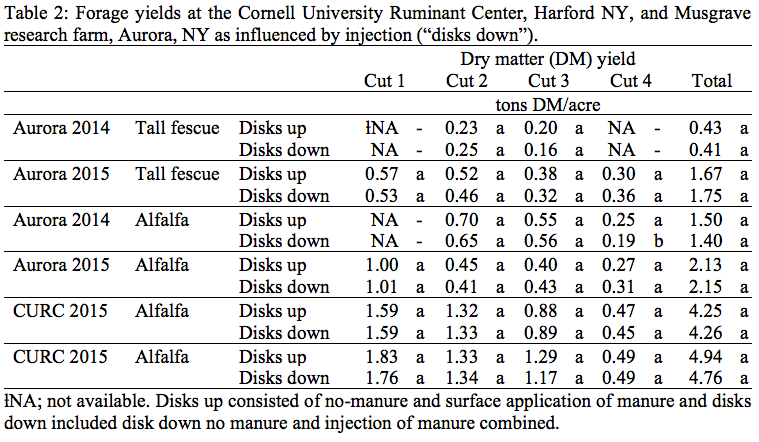 In Aurora, alfalfa and tall fescue yields were comparable between “disks down” (injected) and “disks up” (surface applied) treatments (Table 2) and also for the younger and higher producing alfalfa trials at CURC injection did not help or hurt yields. Though more research (additional locations and year) is needed before drawing broad conclusions, in the test conditions here, manure application benefited old hay stands, both alfalfa and tall fescue, while neither benefiting nor harming higher producing 2nd year alfalfa. These results suggest that grass benefits most from manure addition but that yields of old alfalfa stands can be increased with manure as well. These results suggest as well that manure injection does not harm the stand. Further research is needed to better understand what drives the yield response. This material is based upon work that is supported in part by USDA-CIG (NFWF), Federal Formula Funds, Atkinson Center for Sustainable Future at Cornell, and the National Institute of Food and Agriculture, USDA, under Award no. 2013-68002-20525. Any opinions, findings, conclusions, or recommendations expressed in this publication are those of the authors and do not necessarily reflect the view of the USDA. We thank Aurora Ridge Dairy Farm for providing the liquid manure, Peter Kleinman of USDA-ARS for loaning us the Veenhuis unit in 2014, and Scott Potter for working with us on the applications in 2015. For questions about these results contact Quirine M. Ketterings at 607-255-3061 or qmk2@cornell.edu, and/or visit the Cornell Nutrient Management Spear Program website at: http://nmsp.cals.cornell.edu/. The corn stalk nitrate test (CSNT) is an end-of-season evaluation tool for nitrogen (N) management for 2nd or higher year corn fields. The greatest benefit of this test is that it allows for evaluation and fine-tuning of N management for individual fields over time. Corn stalk nitrate test results >2000 ppm indicate that more N was available during the growing season than the crop needed. The summary of CSNT results for the past seven years is shown in Table 1. For 2016, 51% of all tested fields had CSNTs greater than 2000 ppm, while 37% were over 3000 ppm and 19% exceeded 5000 ppm. In contrast, 13% of the 2016 samples tested low in CSNT. Crop history, manure history, other N inputs, soil type, and growing conditions all impact CSNT results, and crop management records that include these pieces of information can be used to evaluate CSNT results and determine where changes can be made. Weed pressure, disease pressure, lack of moisture in the root zone in drought years, lack of oxygen in the root zone due to excessive rain (anaerobic soil conditions), and other stress factors can impact the N status of the crop as well, so in some circumstances, additional N might not have been able to overcome the real reason for the low CSNTs (e.g. no amount of N fertilizer can make up for a drought). The 2016 data are consistent with 2012, another drought year with just 13.6 inches of rainfall between May and August. Large percentages of excessive CSNTs (36-40%) are also observed during very good growing seasons (2010, 2014) possibly due to a greater N supply by soils when growing conditions are good (moisture and heat). These data point out the need to evaluate CSNT result in light of not just manure and fertilizer N management but also in light of the weather patterns that year. It does, also show the need for multiple years of testing to gain experience with on-farm interpretation. In addition, within-field spatial variability can be considerable in New York, requiring (1) high density sampling (1 stalk per acre at a minimum) for accurate assessment of whole fields, or (2) targeted sampling based on yield zones, elevations, or soil management units. It is recommended to gather at least two years of data before making any management changes unless CSNT’s exceed 5000 ppm (in which case one year of data is sufficient). Figure 1: In drought years like 2016, more samples test excessive in CSNT while fewer test low or marginal. This is consistent with the reduced yields in drought years. Agronomy Factsheet #31: Corn Stalk Nitrate Test (CSNT) (http://nmsp.cals.cornell.edu/publications/factsheets/factsheet31.pdf). The thank the many farmers and farm consultants that sampled their fields for CSNT. For questions about these results contact Quirine M. Ketterings at 607-255-3061 or qmk2@cornell.edu, and/or visit the Cornell Nutrient Management Spear Program website at: http://nmsp.cals.cornell.edu/. In 2016, corn rootworm control failures have been once again reported in central NY. As reported in 2013, the control failure was in fields planted to corn containing a single rootworm BT toxin, Cry 3Bb1 (Figure 1). Severe rootworm injury is usually easy to spot during the growing season by the goose-necked corn plants. The plant tilts over due to the loss of roots and then the stem straighten up, leaving a curved plant stem. 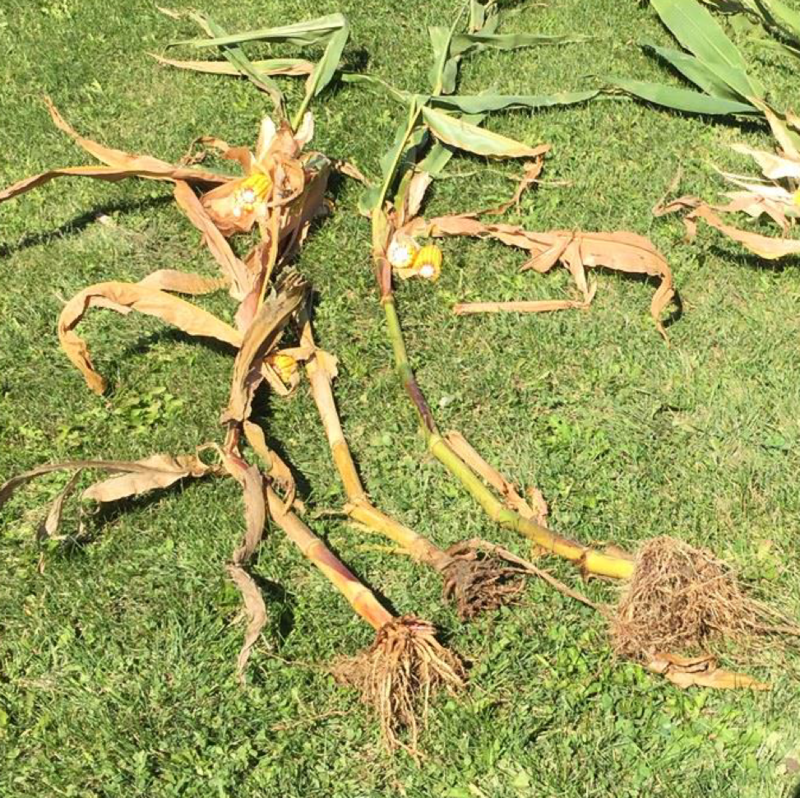 Many times during fall harvest, lodged plants are blamed on corn rootworm damage. However, during the fall, many of the lodged plants have straight stems and have fallen over due to their poor rooting, top heavy condition and wet soils in the fall. The key diagnostic characteristic for rootworm damage in the fall is the curved stem. Root damage and plant lodging from corn rootworm larval feeding. The curve stem of the plant is characteristic of this type of feeding, which occurs in July. The plant tips over from loss of roots and then turn back up. These plants contain CRW-BT Cry 3Bb1 protein and the larvae feeding on the roots were not killed by the toxin. Keeping the various BT traits straight and which corn varieties they occur in is an ever changing and difficult task. One very helpful tool is the “Handy BT Trait Table” published by Dr. Chris Difonzo at Michigan State University. The 2016 version of the table can be located at www.msuent.com/assets/pdf/28BtTraitTable2016.pdf. The 2017 trait table is not available until March 2017 and can be located by conducting a Google search using “Handy BT Trait Table” as the search words. For corn rootworm control with plant incorporated BT, we have only three groups of BT proteins in our toolbox. The first protein Cry 3Bb1 was first incorporated into corn by Monsanto and was the first BT-CRW protein marketed. The second protein is Cry 34/35, a two protein/toxin mixture, incorporated into corn by Dow and the third group is the Syngenta proteins mCry3A and eCry3.1Ab. Some corn varieties have two groups of CRW proteins incorporated called a pyramids. For example, a common pyramid is Cry 3Bb1 and Cry 34/35. As predicted, corn rootworm is developing resistance to these widely deployed corn incorporated proteins across the corn belt with resistance to Cry 3Bb1 the most wide spread. Multiple field failures have been reported to mCry 3A in the Midwest and fields with poor control have been reported planted to corn with Cry 34/35. In the Northeast, reports of resistance to Cry 3Bb1 occurred in NY in 2013 and 2016 with reports of resistance to mCry 3A in Pennsylvania in 2014. With new technologies on the distant horizon, producers should make a focused effort on preserving the current BT-CRW technology as long as possible. If a farm is experiencing a loss of control or performance from the BT-CRW toxin, there are several effective strategies to use which has both the benefit of reducing losses in future years and helping to preserve the technology from increased insect resistance. Since corn rootworm eggs overwinter in corn fields and the newly hatched larvae must find a corn root to survive, crop rotation remains an effective CRW management tool. Simply rotate the field to another crop for a season and then the field can be rotated back to corn the following year without the need for any CRW management measures. If growers still have insecticide boxes on their planter, excellent control can still be achieved using an application of soil insecticide in a 7” band in front of the press wheel. In furrow applications have a reduced efficacy compared to the 7” band. The use of a liquid insecticide such as Capture either in furrow or in the fertilizer band is widely considered as ineffective against CRW larvae. If the field has experienced loss of performance with a corn variety containing Cry 3Bb1, then plant a corn variety using Cry 34/35. Substituting a corn variety with mCry 3A or eCry3.1Ab CRW toxin is not the best choice because of potential cross resistance (observed in the laboratory) with Cry 3Bb1. If the loss of performance is due to a corn variety containing Cry 34/35, then any of the Cry 3 choices would be appropriate. For example, if Cry 3Bb1 is giving poor control in the field, planting a variety which contains both a Cry 3 toxin (Cry 3Bb1, mCry3A or eCry3.1Ab) and Cry 34/35 with only a 5% refuge in the bag puts a lot of selection pressure on the CRW population to develop resistance against Cry 34/35. The dual CRW-BT toxin containing corn varieties were allowed to be marketed with only a 5% “refuge in the bag” under the conditions both toxins where effective on the insect population. When a soil insecticide is used in addition to a CRW-BT trait with a history of poor CRW control, this combination increases the development of CRW resistance to the event. A soil insecticide applied either in furrow or banded in a 7” band protects the area surrounding the base of the plant from larval feeding. However, this insecticide application has no impact on the CRW larvae feeding on corn roots outside the insecticide treated area surround the plant base. CRW larvae feeding outside the insecticide protected zone are still being exposed to the failing BT toxin and larvae continuing to survive feeding on the toxin will continue to interbreed with other survivors, resulting in an increased level of resistance in the next generation of rootworms. Soil health refers to the ability of a soil to function and provide valuable ecosystem services. 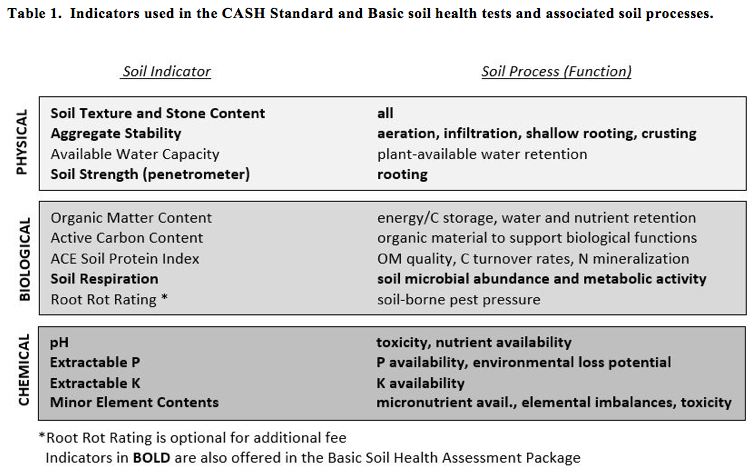 The Comprehensive Assessment of Soil Health (CASH) is a testing approach developed at Cornell University that measures multiple physical, biological, and chemical soil properties linked to key soil processes (Table 1). It remains largely unclear how soil health varies in different agro-ecological regions, and whether interpretation schemes should therefore be adjusted. As a preliminary investigation into these questions, we used the CASH sample database to compare the soil health status of 5,767 samples collected from the Mid-Atlantic, Midwest, and Northeast regions of the United States. CASH uses scoring functions that are developed using the cumulative normal distribution (CND) of measured values in our database for each indicator. Scoring functions for physical and biological CASH indicators are calculated using the CND, whereas chemical indicators are scored based on experimentally-established thresholds. Some, but not all, indicators showed texture-dependence; in these cases, separate scoring functions for coarse, medium, and fine textures were developed. The scoring function allows for the interpretation of the measured value for each indicator on a scale ranging from 0 to 100. This approach lets us assess how a particular soil sample scores relative to other similarly-textured soil samples in our records, and thereby make some judgment on the relative health of that soil to identify possible problems. Since it began offering soil health testing services in 2006, the Cornell Soil Health Lab (CSHL) sample database has grown considerably in size and geographic scope. After evaluating the number of samples analyzed from each of the 48 continental United States, we identified three regions having sufficient sample size (n=5,676 total) including the Mid-Atlantic, Midwest, and Northeast. These regions align with the United States Department of Agriculture (USDA) Natural Resources Conservation Service (NRCS) Major Land Resource Areas (MLRA) (Fig. 1). 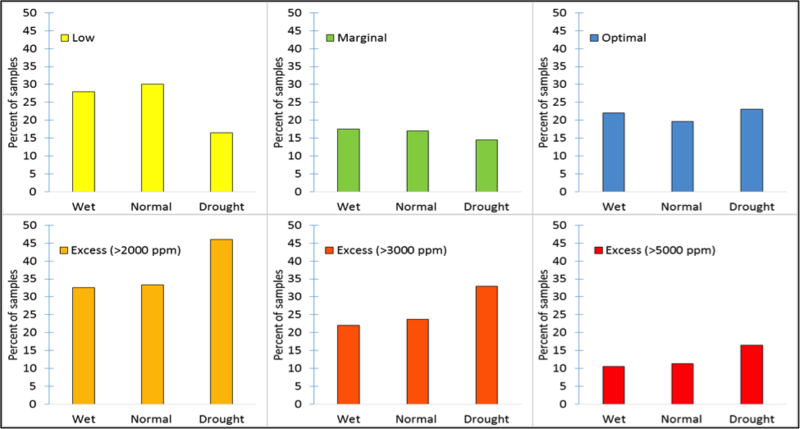 Descriptive statistics and ANOVAs of sub-datasets by region and soil textural class for all CASH indicators were performed, allowing comparisons among these three regions in measured values of soil health indicators. The medium textural group made up the largest proportion of our database, and for brevity we only report this textural group results here (Table 2). A manuscript that also includes results of fine and coarse textural groups is in preparation for publication by Fine et al. (2017). Figure 1. 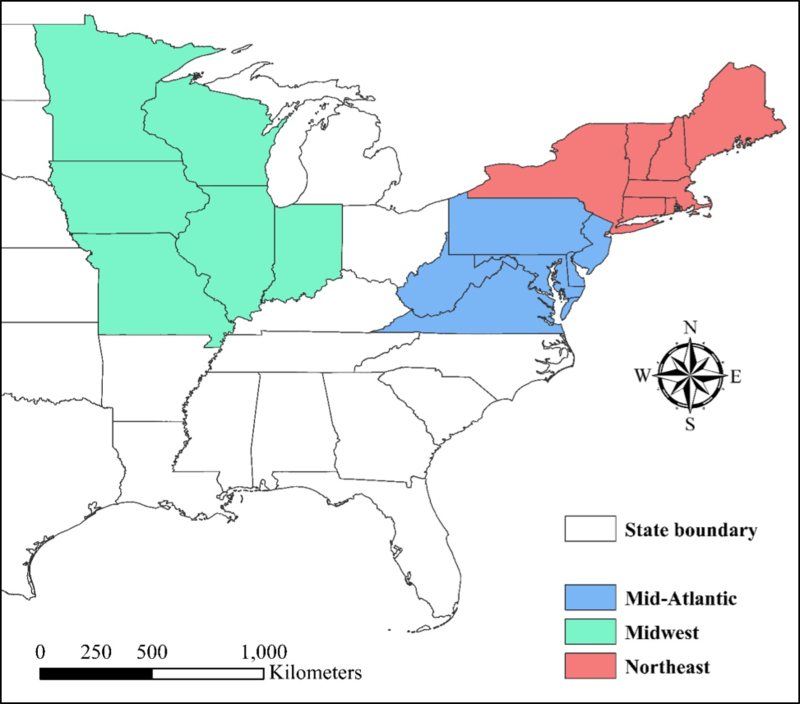 Mid-Atlantic, Midwest, and Northeast regions of the United States. Soil health samples from each region were aggregated into sub-datasets for statistical analyses and regional comparisons. With this investigation, we observed significant regional differences in mean measured values for most physical, biological and chemical indicators (Table 2). For medium-textured soils, significant differences between regions were observed for most indicators except subsurface compaction (PR45) and extractable potassium. 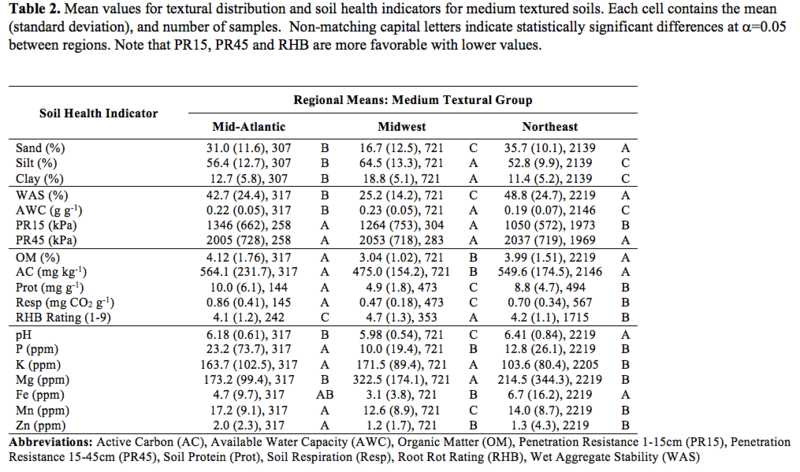 In general, soil health values for the Midwest region were less favorable compared to the Mid-Atlantic and Northeast, notably for Wet Aggregate Stability, Organic Matter, Active Carbon, Protein, Respiration, and Root Health. Extractable phosphorus levels were notably higher in the Mid-Atlantic region. Although sample sizes between regions were unequal, Midwestern soils generally showed lower variability (standard deviations) in measured values. These results offer insights into regional soil health differences that can be attributed to genetic and management factors. The lower mean values observed for biological indicators and Wet Aggregate Stability in Midwest soils counter the common notion that Midwestern soils are of superior quality than those in other regions. How can this be explained? First, there are likely differences in cropping systems. Northeast and Mid-Atlantic soils generally receive more organic inputs (especially manure) and are often managed to include diverse rotations with perennial crops, as opposed to typical corn-soybean rotations in the Midwest. Second, the standard CASH is limited to the 0-to-6 inch depth interval, and, therefore, the deeper soils and organic matter accumulation in many fertile Midwestern prairie soils is not captured by the test. Finally, these findings could suggest an inherent bias in our data set, so conclusions should be interpreted with some caution. What have we learned? An investigation into regional soil health status (Mid-Atlantic, Midwest, and Northeast) showed significant differences in mean measured values for most physical, biological, and chemical indicators. Evidence suggests that the development of region-specific scoring functions may be appropriate, but would require more complete regional soil health data collection and analysis. In all, this project provided valuable insights into the soil health status of three different agro-ecological environments. We conclude that the CASH approach can be successfully applied to evaluate the health status of soils of differing agro-ecological environments, but that interpretations likely need to be regionally adapted to be most meaningful. For more details about the CASH framework, visit bit.ly/SoilHealthTrainingManual for a free download of the third edition of the training manual. Fine, A.K., van Es, H.M., and R. R. Schindelbeck. 2017. Statistics, Scoring Functions and Regional Analysis of a Comprehensive Soil Health Database. Soil Science Soc. Am. J. (in preparation). What are perennial grain crops? Grain crops constitute the majority of human caloric intake and have been bred for high yields and consistent production. Although these crops are incredibly productive and feed billions of people every year, intensive cultivation of grain crops can contribute to soil and water degradation because of annual operations that often include planting into tilled soil. Figure 1. Kernza, a perennial grain, prior to grain harvest at the Cornell Musgrave Research Farm in Aurora, NY, on August 11, 2016. Perennial grain crops are one solution to some of the problems associated with annual grain crops. Perennial grain crops have lower annual production costs than annual grain crops because farmers do not need to purchase seed or use labor and fuel for planting each year. Because of year-round ground cover and deeper root systems than annual crops, perennial grains can also be produced more sustainably on sloped land that is prone to soil erosion. Dr. Wes Jackson, founder of the Land Institute in Kansas, has been promoting perennial grains for the last 40 years. 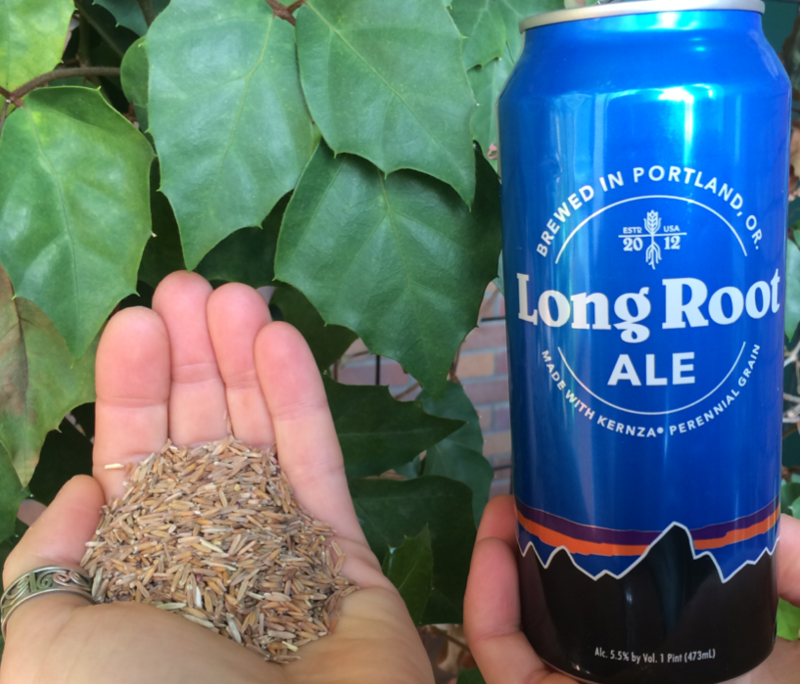 At first perennial grain crops were just an idea, but now they are becoming a reality and attracting the attention of farmers, bakers, brewers, and consumers. One particular perennial grain crop, intermediate wheatgrass (Thinopyrum intermedium) is especially advanced and well poised for adoption. However, grain yields of intermediate wheatgrass are substantially lower than from comparable annual grain crops, such as wheat. Intermediate wheatgrass is a long-lived, rhizomatous perennial grass native to central Asia. In the early 1980’s, researchers at the Rodale Institute evaluated nearly 100 perennial grass species for potential domestication, and selected intermediate wheatgrass due to its favorable yield potential, nutritional profile, and suitable agronomic traits. Work with intermediate wheatgrass was later carried out at the NRCS Big Flats Plant Materials Center in Big Flats, New York. Now, Dr. Lee DeHaan at the Land Institute in Kansas is leading breeding efforts with this perennial grain crop, which is marketed as Kernza®. Figure 2. De-hulled Kernza grain (left), harvested from plots in Aurora, NY and a can of the first commercially available product made from Kernza grain (right). The Cornell Sustainable Cropping Systems Lab has been working on perennial grains for the past two years. Here we summarize some of our recent projects related to perennial grains. In August of 2014, we initiated a long-term experiment (Figure 3) at the Cornell Musgrave Research Farm in Aurora, NY in collaboration with Dr. Steve Culman (a Cornell Soil and Crop Sciences alumnus, now Assistant Professor of Soil Fertility at The Ohio State University) and five other researchers across the US. The objectives of this experiment are to: 1) determine the effects of harvesting forage on Kernza grain yields and profitability, and 2) evaluate Kernza grain and forage yields over time across multiple environments. Figure 3. 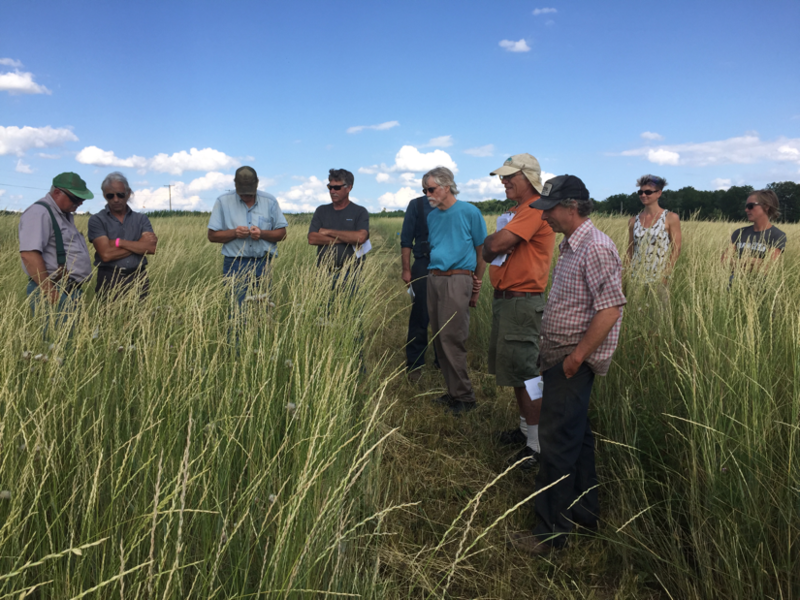 Farmer advisors and Cornell University researchers evaluate a plot of Kernza at the Musgrave Research Farm, July 19, 2016. We planted Kernza at 15 lb seed/acre at 7.5-inch row spacing using a grain drill. Although this experiment compared several treatments, here we focus on two. One treatment, ‘Grain’, was harvested for grain and then straw in the summer. The other treatment, ‘Forage & Grain’, included a spring forage harvest prior to stem elongation (Figure 4) in addition to the summer grain and straw harvest. We measured forage yield, grain yield, and plant height at grain harvest. Figure 4. Kernza harvested for forage prior to stem elongation by cutting the early vegetative growth to a height of 4-inches on May 9 2016. In 2015, grain yield was lower in the ‘Forage & Grain’ treatment compared to the ‘Grain’ treatment (Figure 5), showing that harvesting forage in the spring can reduce grain yields slightly. In 2016, there was no difference between these treatments. Straw production was greater in the ‘Grain’ treatment than in the ‘Forage & Grain’ treatment in both years (Figure 5). Spring forage yields in the ‘Forage & Grain’ treatment averaged 1,390 lb/ac (standard error ±340 lb/ac) across both years. Noteworthy is that the spring biomass had better forage quality than the straw at grain harvest (Table 1). 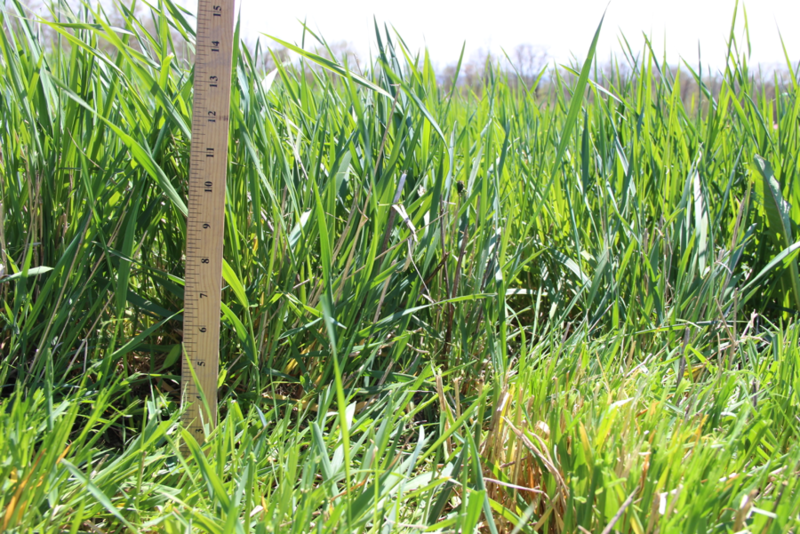 Although it appears that Kernza can produce high quality forage, which might offset the relatively low grain yields and increase profitability, more research is needed to determine how harvesting forage in the spring prior to stem elongation affects crop performance. Figure 5. Kernza straw (above) and grain (below) yield for treatments ‘Grain’ and ‘Forage & Grain’ in 2015 and 2016. Error bars indicate standard error within each treatment within a year. Harvest occurred on September 11, 2015 and August 23, 2016. 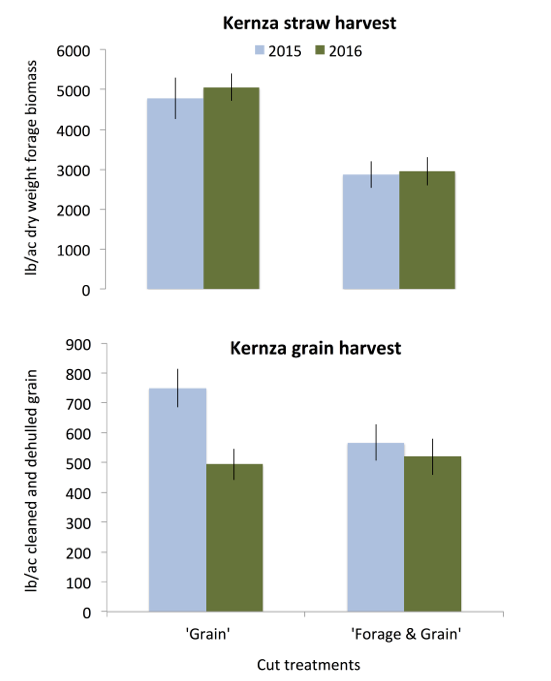 Kernza grain yields are based on a subsample of hulled grain that was hand threshed and a conversion factor was then used to estimate yield expressed as cleaned and de-hulled grain. Table 1. Forage quality metrics for Kernza forage harvested in spring at elongation and in summer at grain maturity in 2015. Prime forage standards from “What is Forage Quality”, Ashley Pierce, Rensselaer County Cornell Cooperative Extension. Spring forage harvest dates were May 22, 2015 and May 9, 2016. Summer straw forage harvest dates were September 11, 2015 and August 31, 2016. Given that perennial grains are a novel development and farmers have not grown these crops before, we conducted an online survey with Dr. Christophe David from ISARA-Lyon in France, to assess farmers’ potential interest in perennial grains. A link to the survey was e-mailed to farmers in the US and France, and posted on pertinent farming websites. A total of 88 and 319 farmers, in the US and France respectively, responded to the survey between June 23 and July 25, 2016. In September 2016, we started a 3-year field experiment at Cornell Musgrave Research Farm in addition to planting three on-farm strip trials with collaborating farmers. The goal of this work is to measure the effect of perennial grains on soil health and to work with farmers to develop management guidelines. The grain from our field experiments will be tested by local bakers, brewers, and distillers, which will help guide future research. At the Cornell Musgrave Research Farm we are comparing perennial rye (Secale cereale x S. montanum) and Kernza side-by-side with an annual malting barley cv. ‘Endeavor’ and a hard red winter wheat cv. ‘Warthog’. These plots will have a split-plot treatment of interseeded red clover, which is a short-lived perennial legume forage crop. Frost-seeding red clover into winter wheat is common for farmers in New York, as it can improve soil health and also be harvested for forage. We selected these treatments to compare the two most promising perennial grain crops to two annual grain crops that farmers are currently growing in the region. Grains were drill seeded at 7.5-in row spacing using the standard seeding rate for each species on September 19, 2016. We aim to test two hypotheses over the next three years: 1) Transitioning fields used for annual grain crop production to perennial grain crop production increases soil health, and 2) Intercropping legume forage crops with perennial grain crops reduces need for nitrogen inputs compared to perennial grain monocultures. In addition to evaluating soil health parameters, we will also be monitoring crop and weed biomass, disease incidence, yield, and grain quality to further inform future development of best management practices for perennial grain cropping systems. The Land Institute hosted a meeting in July 2016 to bring together researchers from around the world who are interested in Kernza. Attendees included plant breeders, geneticists, agroecologists, and producers of grain-based products. Sandra Wayman represented the Cornell Sustainable Cropping Systems Lab and presented on our research. The take-home message from this meeting was that there is strong interest in developing products made from Kernza and more research is needed for management practices. For example, Zachary Golper, baker and owner of Bien Cuit in Brooklyn, spoke about the need to scale up production to support his interest in incorporating Kernza into his products. 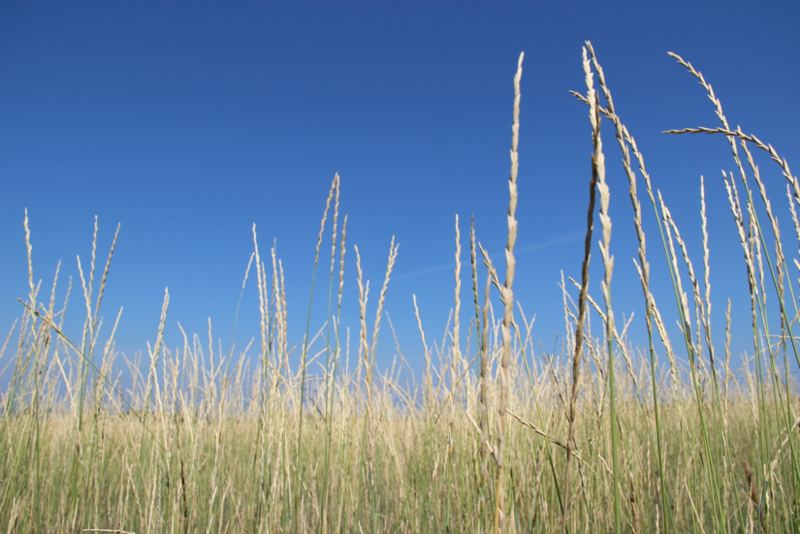 Perennial grains are becoming a plausible option for farmers. Although grain yields are still much lower than annual grain crops, harvesting perennial grain for both forage and grain could increase profitability. Additionally, growing perennial crops on land unsuitable for annual crops that require yearly tillage (e.g. sloped land) could make them more attractive to farmers. As with any new crop, we have experienced some challenges in our research including difficulty harvesting grain and weed suppression during the establishment year. However, we remain optimistic about perennial grain crop production in New York and look forward to working with our farmer collaborators to improve production. Jackson, W., 1980. New Roots for Agriculture. U of Nebraska Press.